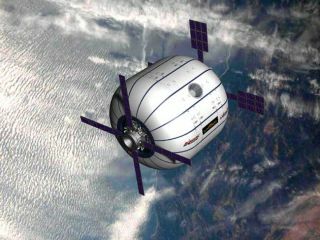 Bigelow Aerospace has an expedited schedule to orbit their Sundancer module capable of supporting crews in Earth orbit. But the missing ingredient may be transporting people to the privately-built facility. GOLDEN,Colorado ? Two privately-built prototype modules are circuiting the Earth ?prelude technology to seed space with far larger orbital housing that support humanoccupants. Lofting allthat living room into Earth orbit is on the business agenda of BigelowAerospace of North Las Vegas, Nevada ? but the company faces significantchallenges in attaining their sky-high goals. Theprivately-backed Bigelow Aerospace Genesis1 and Genesis 2 expandable sub-scale space modules were shot into orbit? on July 12, 2006 and June 28, 2007, respectively ? via Dnepr boosters fromthe ISC Kosmotras Yasny Cosmodrome, located in the Orenburg region of Russia. Both remainin excellent shape, providing valuable data on the use of expandable spacestructures for crews, not only in low Earth orbit, but on the moon and Mars, saidMichael Gold, Corporate Counsel for Bigelow Aerospace in Chevy Chase, Maryland. ?We?reahead of schedule,? Gold told SPACE.com, thanks to the success of theGenesis craft that are proving out the fundamentals of the Bigelow Aerospace moduledesign. In an August 13 message from RobertBigelow, president of the entrepreneurial space firm, he underscored thefact that global launch costs were escalating. ?Theseprice hikes have been most acute in Russia due to a number of factors includinginflation, previously artificially low launch costs and the falling value ofthe U.S. dollar. What this now means for Bigelow Aerospace is that to conductanother subscale demonstrator mission would cost two to three times what it hasin the past,? Bigelow explained. That beingthe case, Bigelow announced an expedited schedule ? one that skips an in-orbitflight of a module dubbed Galaxy?and fast forwarding directly to the much largerSundancer ? an expandable habitat capable of being boarded by humans. ?We stillintend to construct and test the Galaxy spacecraft and/or various parts of itin order to gain familiarity and experience with critical subsystems. However,by eliminating the launch of Galaxy, we believe that Bigelow Aerospace can movemore expeditiously to our next step by focusing exclusively on the challengingand exciting task presented by the Sundancer program,? Bigelow reported. But while Sundanceris already taking shape ? with 2010 eyed as the time period for launch ? italso brings about some bad news, Gold said. ?Our schedule is so aggressive andour progress has been so good, it is creating some significant concerns interms of transportation,? he added. Gold urgedlaunch companies to recognize the fact that the International Space Station isnot the only destination target out there. ?It is very disconcerting where thelaunch industry is today,? he noted. While thereare rockets, both domestic and foreign, to loft the large and heavier Sundancermodule, affordable, reliable, and safe transportation of crews to the privateoutpost is missing right now, Gold said. Why notutilize the RussianSoyuz spacecraft to send crews to Sundancer? From a simple financialperspective, Gold responded, ?we don?t know if it can support the businesscase? of Bigelow Aerospace. ?It?s probably not a financially viable choice forus.? Sundanceris meant to form the foundation of a futureBigelow Aerospace space complex, one that ties separate modules together toform an even larger on-orbit facility. Moreover, the company has its sights seton beyond Earth applications of expandable structures. ?I thinkit?s widely acknowledged that expandable habitats are where we are heading,whether it?s the moon, Mars or beyond,? Gold emphasized. ?Low Earth orbit isthe first stage of that?to test the systems prior to deploying anything on themoon or Mars. What we learn in Earth orbit will be absolutely vital toexpanding the technology to future worlds.? Meanwhile,the two Genesis-class modules continue to rack up space mileage as they circlethe Earth. The intent is that the dual spacecraft will provide priceless datafor years to come. The ?Fly YourStuff? initiative ? in which participants paid to fly items inside the Genesisspacecraft is completed, Gold said. Engaging the public in future Bigelow Aerospaceventures will continue, he said, in one form or another. Anotheridea being prototyped on Genesis 2 is the use of a projector on the tip of the craft?ssolar arrays. That equipment casts an uploadable image on the side of theorbiting module. The resolution and clarity of those images has proven theconcept workable ? and also bolsters the prospect of being a revenue-generatingidea, Gold said. Operatingtwo spacecraft through a telemetry network -- with mission control sited in LasVegas ? has proven invaluable, Gold said, particularly in terms of sharpeningthe skills of ground control teams for future missions. Expandingthe company?s communications network to handle humans on orbit is the nextstep, Gold continued, with plans for adding more ground stations on an annualbasis. Gold saidthat the great irony of space is that the technology has never been thelimiting factor. ?It?s a matter of politics. It?s a matter of financing. Andthose two challenges are much, much worse than any engineering issue that willarise.? ?Thesuccess of Genesis 1 and Genesis 2 was not only technological?it was provingthat we could do it at the cost that we did,? Gold stated. ?I would be willingto gamble that the two missions will go down in history as the mostcost-effective space operations in history. That?s the paradigm shift?that?swhat really needs to occur. ?